A Life without Anorexia: I need snack tips!!! But now i feel i am in need of new snack tips and suggestions. A very normal, but delicious snack i had today!!! 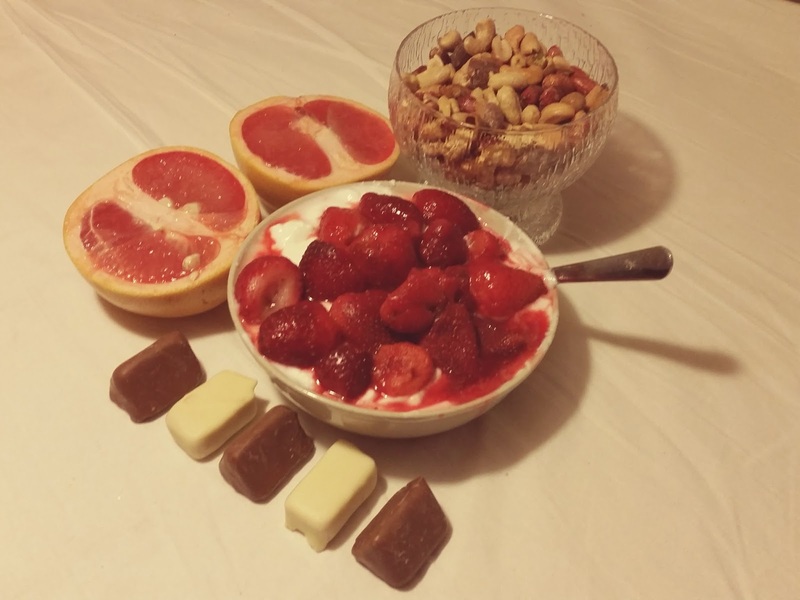 I´m the same :) My snack everyday is quark mixed with yoghurt on top of fruit. My favorites are now royal gala, fresh mango and banana. And then on top I add pan toasted oats, nuts (cashews and almonds are the best), dried apple, mulberries and gojiberries or raisins. Well, I'm definitely not a snacker person. I eat dinner almost right after school! But I could suggest the must of my breakfast for your afternoons; have you ever tried plain oatmeal, made of just rolled oats, water and possibly milk? I can't get enough of it - and the only thing I add is a flood of fat, oh yes, oh God yes that combo! You need to give it a shot. The cinnamon rolls are great as a snack!! And the quinoa salad is amazing! You can do oatmeal with tons of different toppings like peanut butter, different types of granola, blueberries, strawberries etc and add a little bit of milk to it. Theres also peanut butter with apples or nutella and goat cheese on crisp bread. I went through a phase when I would put yogurt, cheerios, peanut butter, banana, peanuts and some milk in a bowl and would mix it up! 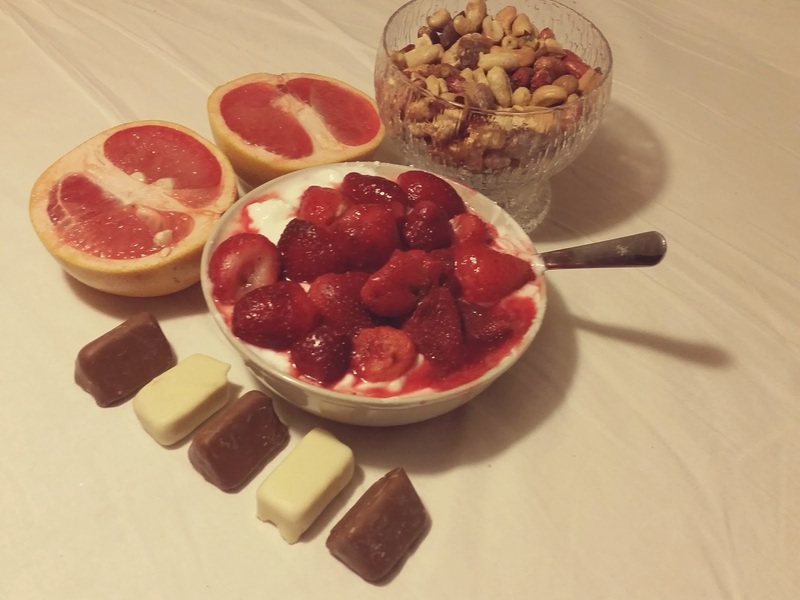 It was pretty good and you can substitute some of the ingredients or used flavored yogurt like strawberry or mixed berry for extra flavor. Another favorite of mine is after my family and I make a pizza. We take the left over sauce and cheese and put it on bread and put it in the oven for a few minutes. Sometimes when we don't have sauce I do it with just bread and cheese! haha You can also make a sunday or banana split and add toppings like fruit, sprinkles, whipped cream etc. Or make your own donuts. Im not sure how, but ive seen people do it before. Oh one that's really good that can be cooked or raw is cauliflower! You put your favorite seasonings on it add some butter and mix it into a bowl. Then if you want to cook it you put it on a sheet tray and cook it like normal. Im not sure what spices or for how long though, its my aunts recipe. I had these a lot this past month, hope it helps!! Oh and chocolate covered pretzels!! Yum yum! Another one can be this : Cut a cucumber in slices and with a spoon remove the seeds , then add tuna in the middle and that's all :D.
French toast! Take 2 slices of normal bread or sweet bread like broiche or raison/fruit bread and dip in whisked up egg whites. Sprinkle with cinnamon and sweetener and fry lightly until golden brown. Eat hot with ice cream/yogurt/granola or whatever you like! Your snack looks soo mouthwatering!! Hmm... Snacks, snacks...You can make tortillas with cheese and tomato :) You take a tortilla and put it on the stove so it fries. Put the cheese and tomato on it, however much you like and then once the back of the tortilla starts browning and the cheese or oatmeal has melted you just fold it in half and you're done!! Another one Ive been wanting to try is popcorn with crushed oreos and over it you pour white melted chocolate. I just know it would be an awesome combination!! My favourit snack is a fruit salad with coconut on it and maybe some ice-cream too.